Fashion icon Iris Apfel has launched a home decor collection with graninroad. The collection contains nearly 50 pieces. It includes furniture, home decor, artwork and more. Iris, who started out as a decorator and textile designer, says of her collection, "In the fashion world I always tell people to have fun with their looks and styles, it is no different for their homes. Enjoy your spaces and celebrate them through your own beautiful style." 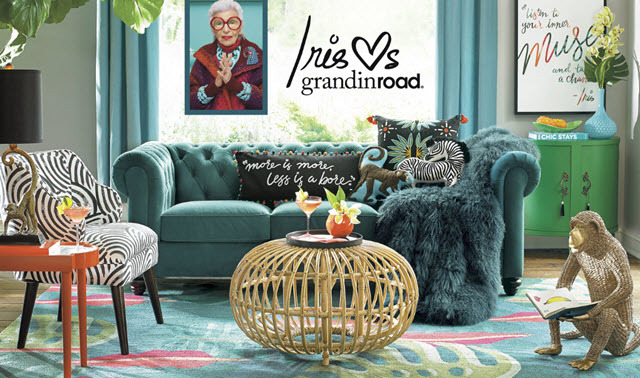 Jason Jones, President of grandinroad, says in the announcement, "We're beyond thrilled to work with Iris Apfel on this comprehensive home décor collection. Iris and grandinroad both believe in empowering your own style." You can find the collection on grandinroad.com. Some of the pieces include a jungle print pillow, rattan mobile cart and tufted velvet sofa. Some of the items are animal themed, including elephants, monkeys, zebras and ostriches. The Iris Apfel Elephant Tea Pot is pictured below.